Metal Alliance Tour Draws Near + Band To Play Knotfest Colombia! The road demons in GOATWHORE are gearing up for another live takeover later this month beginning with a performance at Knotfest in Bogotá, Colombia on October 26th. The band will be playing alongside the likes of headliners JUDAS PRIEST, HELLOWEEN, KREATOR, and ARCH ENEMY before kicking off their anticipated North American tour as headliners of the 2018 edition of Metal Alliance. The trek begins on October 31st in New Orleans, Louisiana, and runs through November 30th in Easton, Pennsylvania. Support will come from THE CASUALITIES, BLACK TUSK, and GREAT AMERICAN GHOST as well as MORTHEREON and GOZU on select dates. For tickets and special VIP packages vsit: metalalliancetour.com. 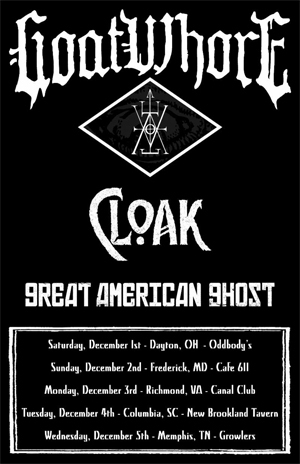 The following month, GOATWHORE will march on playing five more headlining shows with CLOAK and GREAT AMERICAN GHOST from December 1st in Dayton, Ohio through December 5th in Memphis, Tennessee. The band's latest journey follows their near month-long European run supporting DYING FETUS this past summer. See all confirmed dates below.